I bought this one cause the Zircon I had for two years (with maticulous care) just stopped working. 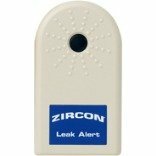 I wrote to the people at Zircon and they wrote back "What are you disappointed about? How can I help?" leading me to believe they stand by their products, but that was the last communication in over two weeks. I hope that this one lasts more than a couple of years, however the quality of this one does not seem to be as good as the old one which broke. I get more mysterious false indications with the new model. I am thinking that the one which just detects the metal in the screws might have been the better choice. We want to give the explanation for why Zircon stud finders are not well suited for lath and plaster applications. 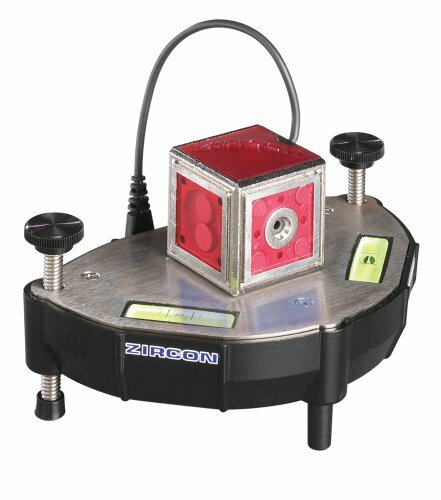 Zircon (and all) stud finders measure "density" or "capacitance" behind a wall, floor or ceiling. For them to function correctly, they need to move from a point of lower density to one of higher density. You can think of it as going from a place that is more hollow to a place that is less hollow. Stud finders don't work well in lath and plaster for that exact reason -- because there are multiple pieces of wood (lath), coupled with the fact that plaster inconsistently leaks through the laths to create varying depths (or densities). So, because of the constantly varying depths, the stud finder is constantly trying to recalibrate, and therefore will not find the studs. They do work in concrete, by the way, because the material is of a more consistent density than lath and plaster. 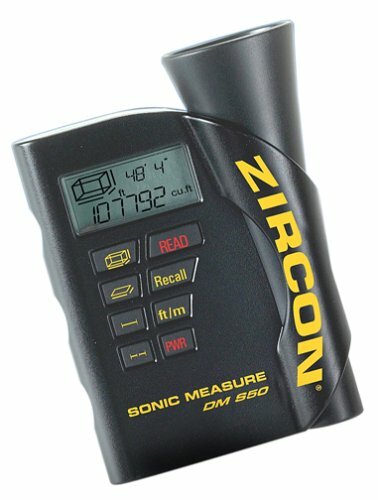 This is NOT something that is particular to Zircon stud finders, however. Any manufacturer's product will produce the same results. And we do try to alert users to this in the operating instructions. There is a work-around. Use a TriScanner or MultiScanner (not a Pro SL) and turn on "Metal" scan. Then, you can locate nails behind your wall. By locating a vertical row of nails, you have a pretty good, although not certain, idea that you've found a stud. Then switch back to "Stud" scan to verify. As I said, this isn't foolproof, but many owners of lath and plaster walls have found it effective. I spent a great deal of time attempting to get results on a ceiling to install my new Dutch Oven Copper Pot Rack. No go, after trying every tip they mentioned for 45 minutes, I gave up. Works fine on walls, though be careful you don't have interference from wiring or perhaps switch boxes that may reside on the opposite side of the wall. Small, but full of features. 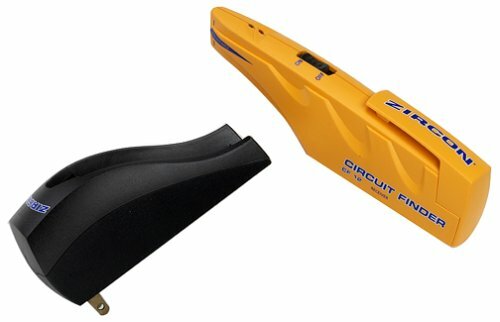 I needed to replace my old stud finder and went looking for the 'latest and greatest' on the market today. For the price, you can't beat this product! The visible beam marking the edges of studs is dead-on. The audible sound feature, in conjuction w/ the light-scale gauge make locating nails/screws/anchors in studs a snap. On top of that, all of these features come in a compact package that even includes a pocket/belt clip. 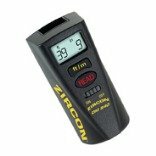 I own a few Zircon 64003 Water Detectors and I'm glad I bought them. Plainly put they work and each are as loud as a smoke detector so if one goes off it could wake you. (if you had a flood during the night like I did). A few things to note the alarm won't go off unless the sensor gets wet so positioning of the device is important. Put it where you expect water to pool or to flow or in the case of a sump pump or well put it inside so that you can get a warning before the water over flows. Also the device floats so you might want to anchor or tether it down. Can be invaluable in preventing damage, and calming nerves. When we bought our home, we had a short in a sump pump in a false wall in our basement. Therefore, we used this product to alert us when water, from heavy rain, would begin coming in. We used this product until we found the source of the problem and had it fixed. Another example was an 83-year-old paranoid stepmother who had rainwater seeping under her basement door onto her unfinished basement. Even though this trickle of water sloped directly to, and down a drain she obsessed about it. Therefore, we bought her a couple of these until we could build a "lip" and stop the "problem." It stopped the midnight phone calls. Amen! Now, with some fore thought we placed them next to her washer and stationary tub. As for the below poor review concerning humidity setting off the alarm in Wisconsin basements, his point is well taken considering the nearby Great lakes and the use of dehumidifiers in the times I spend up there. 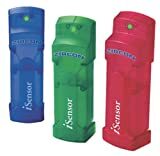 I purchased three of these water alarms three years ago after I woke up with seven thousand dollars in damage when a washing machine hose sprang a leak in the middle of the night. I am now ordering five more, one to go under every sink in my house, after a sneaky leak under an unguarded sink cost me $600 in plumbing and cabinet repairs. The detector could not be simpler in concept. There are two metal contacts approximately a quarter inch apart on the bottom of the unit. When water bridges the contacts the alarm sounds and sounds. You shut the alarm off by drying the contacts with a cloth. I have tested the unit by simply wiping a counter with a wet cloth and setting the unit on the wet table. There is only a thin film of water on the table, but the unit sounds the alarm. I have also found that the manufacturer's claim of a two-year life for a standard nine-volt alkaline battery is conservative. Other uses: Everyone with an aquarium in the house needs one of these babies at the rear of the aquarium stand. I had one in place at my aquarium and it prevented some real damage when a filter developed a leak. purchased at store and detector showed AC detected all the time, even when away from power lines. Perhaps DOA. There is a work-around. If you turn the MultiScanner on "Metal" scan, you can locate nails behind your wall. By locating a vertical row of nails, you have a pretty good, although not certain, idea that you've found a stud. Then switch back to "Stud" scan to verify. As I said, this isn't foolproof, but many owners of lath and plaster walls have found it effective. Today was the second time i was using this toy for serious job. It really was a guessing game. First me, then my brother tried to locate nails in a drywall. For some reason this finder finds them everywhere at the first time and doesn't find any at the second. Tried to find studs with it. Couldn't get it 8 out of 10 times. It also keep finding electrical wires where there is none. 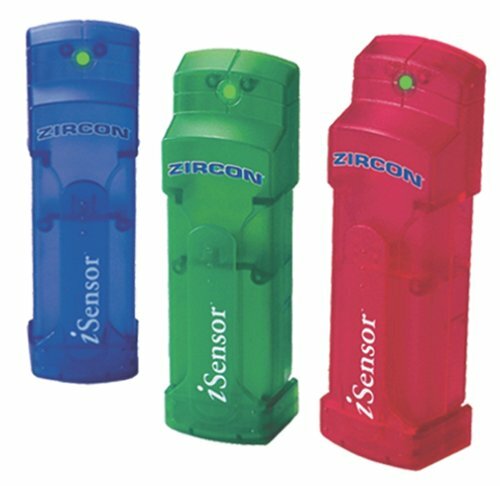 I install hardware as a sub-contractor for a living,and have had great results with this stud finder when it works.However I have owned three of these and every time the on/off switch fails.Because of design,they are not broke by negligence (as the switch is recessed)but by being made with POOR QUALITY parts. 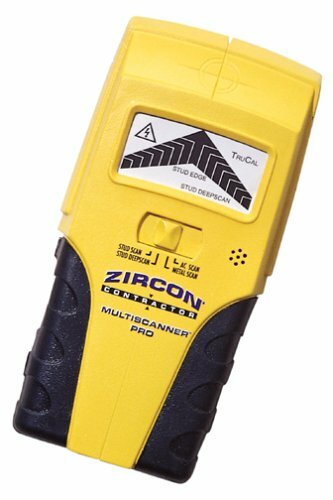 If you want to reliably be able to locate studs, go with another stud finder. If you want a great party game--'hey, who can get the same reading twice?' 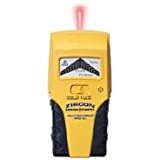 --get this stud finder. I have performed structural inspections on over 8,000 homes with concrete slab foundations. I have used very expensive and very inexpensive metal detectors over the years in my effort to determine how slabs are reinforced and to accurately locate the rebar. 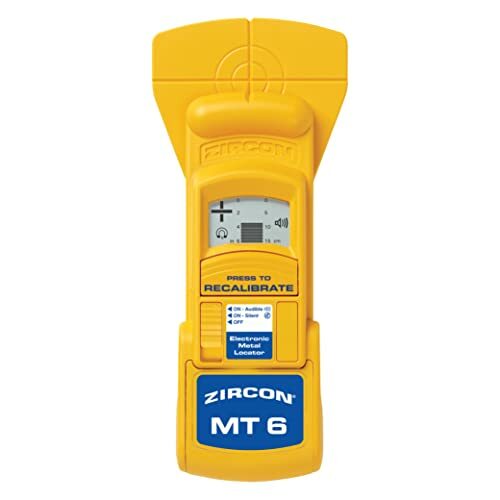 The Zircon MT-6 is the best instrument for the price that I have found to perform these tasks. 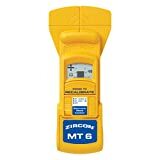 All Of my inspectors have used the MT-6 instrument for several years with good success and satisfaction. This is a very easy to use product that finds not only studs but metal of all sorts on the other side of the wall-or anywhere else. It is very sensitive and can detect wiring, metal supports, you name it. it as a metal detector when I drop a screw in the carpet. How many stud finders can locate a small screw in a deep pile carpet? There is a work-around. If you turn the TriScanner on "Metal" scan, you can locate nails behind your wall. By locating a vertical row of nails, you have a pretty good, although not certain, idea that you've found a stud. Then switch back to "Stud" scan to verify. As I said, this isn't foolproof, but many owners of lath and plaster walls have found it effective. 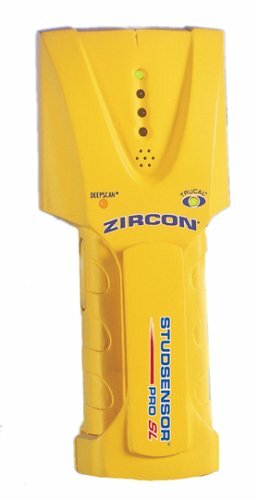 This is the first stud finder I've tried so I can't compare it with any others. It might even be the best one out there but I'm having a fair amount of difficulty with it. It seems straightforward enough to use, but what it's reporting isn't making a lot of sense, leading me to believe it will take a lot more practice. As far as I can tell so far, my wall changes every time I scan it because I'm not getting consistent readings. It's also telling me I have two-foot-wide studs, and other bizarre information that is difficult to interpret. In a few specific spots on my wall it seemed convinced there is a stud. I drilled a hole and got nothing but drywall each time. While I might manage to get some value out of this tool if I keep fighting with it, it's not turning out to be no-brainer solution I was hoping it would be. Certainly one shouldn't rely on its findings exclusively. Combine with the usual Sherlock Holmes methods of manually locating studs. After an hour of testing at home, I returned the expensive Stanley's Intellisensor Digiscan Stud Sensor. The unit turned on by itself! The multiple beeps were annoying. It can be too sensitive and cautious in it's reading and can give false information where I know there is a stud behind the 1/2 inch gypsum board wall. The live AC wire sensor was constantly on where I know the 14/2 wire was more than 24 inches away from the unit. 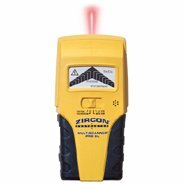 I needed a consistent unit that can reasonably detect wood and metal behind gypsum board to replace a 15 year old Zircon stud sensor. 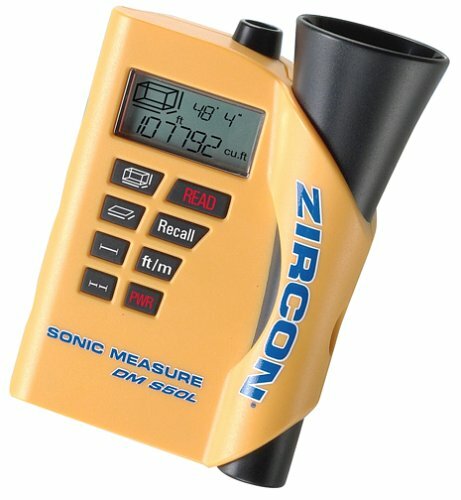 This product is sold as Zircon's "Contractor Triscanner Pro" at Home Depot in Toronto, Canada. It does the job. It's also $5 cheaper than the LCD readout Intellisensor Digiscan. 2) P/N number, Revision number, Patent numbers differ from the information on the packaging, enclosed specifications, and on the back panel of the unit. What's going on? 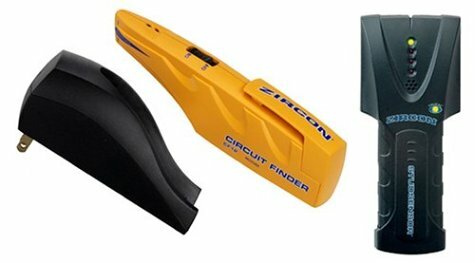 4) For a "3-function" stud sensor, the price is a bit steep in comparison to other stud finders. This is a very easy to tool to use. It's not as fancy as some models, but it gets the job. I've used my extensively, and its made several home projects much easier. The live circuit detector is also a nice safety feature. I have to disagree with the prior reviewer's comments. I purchased this product and can say that it DOES work as advertised. When you first place it on the wall, the auto-leveling mechanism kicks-in and the laser oscillates up and down until it levels (1-2 seconds). You then need to tap it gently to ensure it is level -- something you also need to do if you move the unit from its original position. When I double-checked my work with a spirit level, it was dead-on. Second, I find the size and weight of the iLine to be minimal, especially as compared to other auto-leveling lasers. I used a B&D Bullseye this weekend, and can say that it is heavier, more awkward, and the laser less visible than the iLine. With regards to the pushpin, most such products use pushpins to secure the unit to the wall (except a version of the StraightLine, which does not auto-level). The hole is small, and can be easily touched-up. While the iLine pin does not line up with the laser line, you can easily compensate for this by moving the unit so that the laser line is where you want it. As a DIYer, I find the iLine to be a great product that is very useful and am glad that I purchased it. This product does not do what it proports it will. First, the self leveling feature does not work. I haven't measured the degrees which it is off, but rest assured you will regret using it if you do not double check your level with some other device. I have the odd hung shelves to prove it. It will project a straight line, but it won't necessarily be level. 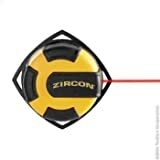 I purchased this item rather than other wall laser levels specifically because it claimed this feature. Next, even if it were to self level (which it does not), the body of the device is so large and awkward it is cumbersome to place on the wall. It comes with a metal push pin which you are to press into the wall at one of the four angles of the device and then let the whole thing suspend from the push pin, which if your hands aren't strong (I am a woman) isn't easy. Also, due to the shape of the device (note it is round with four triangular corners projecting from four sides) the hole you punch into your wall with the push pin will not be in line with the laser line, meaning unless you are trying to place something on the wall which is large enough to extend over the hole once on the wall you will have to be content with looking at a push pin hole or you'll have to go through the effort to fill it and paint over it. I don't know, but I'm figuring most folks are going to be hanging things like shelves and pictures, which first of all won't be lined up with the hole, and secondly are generally going to be hung AFTER the wall is finished and painted, meaning using this device is creating an entirely new project in addition to just hanging the picture or shelf (repairing the damage to the wall created by using the device). In fact, given the shape of the device and the weight (which requires a solidly placed pin to hold it up) I really can't imagine an application where the hole needed to use the thing wouldn't be a problem. You will also note the unit is more expensive than competitors. When browsing I didn't realize how it would be secured to the wall, nor did I anticipate the size or weight of it. I hadn't had the opportunity to see one in a store. I can only say I deeply regret my purchase, and had I purchased it from a brick and mortar store I guarantee I would have returned it the day I tried to use it. I took the time to write this review to prevent any other weekend decorator from making the same mistake I did. The editorial review says "Measurement functions include length, area, volume, double segment length, and continuous measurement."